Subscribe to get the latest USGS groundwater news and science sent to your inbox every month! Screenshot of Southern High Plains Hydrogeologic Data Explorer potentiometric contours layer for the Ogallala aquifer from 2015. Source: USGS Press Release, 3/22/2019. USGS groundwater model data releases from recent USGS publications. USGS strives constantly to improve our online data release and visualization tools. 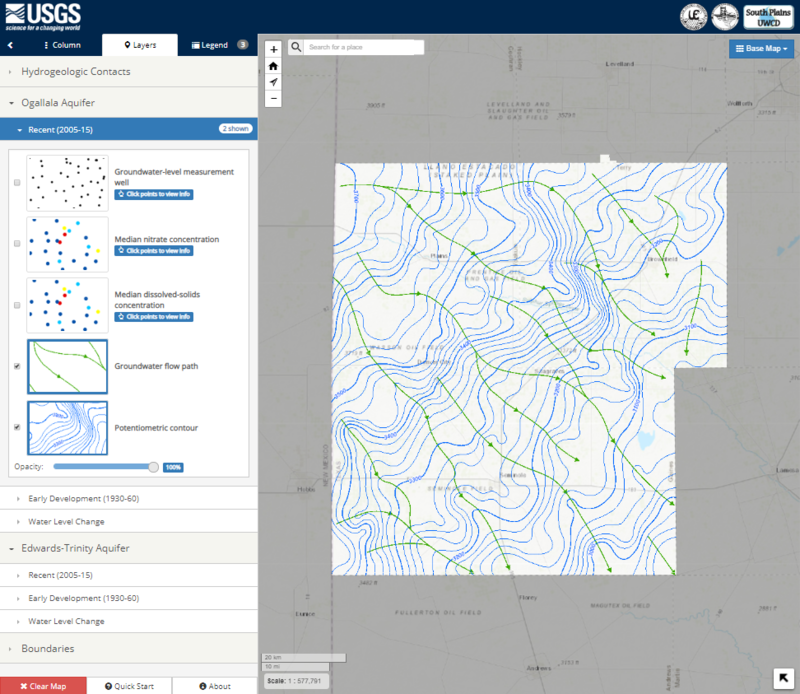 For example, USGS recently released a new interactive viewer to visualize groundwater resources in Gaines, Terry, and Yoakum Counties, Texas. Using the online tool, groundwater users, resource managers and scientists, can view data on groundwater levels, water-quality conditions, hydrogeologic unit extents, changes in groundwater conditions over time, and more. For an overview of the new tool, view the recent press release. The USGS Active Groundwater Level Network includes about 20,000 wells that have been measured by the USGS or USGS cooperators at least once within the past 13 months. The animation shows a daily snapshot of water-level statistics in the network for March 2019. Credit: USGS. The image is in the public domain. Did you know USGS uses geophysics to study groundwater? Hydrogeophysical tools can provide data that USGS scientists use to improve our understanding of groundwater levels, groundwater quality, and the structure of the ground below us. 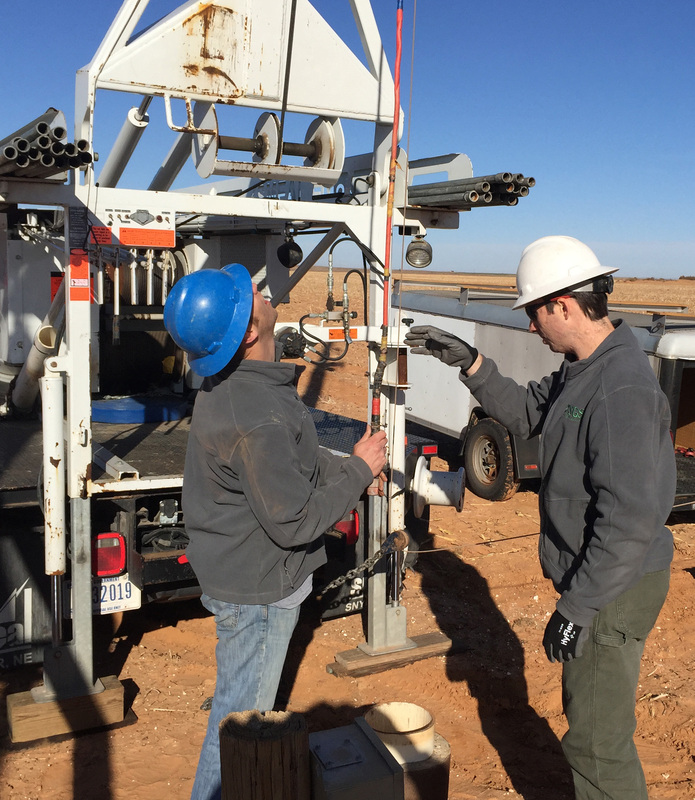 In these photos, USGS scientists from Texas are preparing geophysical tools as part of recent groundwater studies. The data were used to improve the spatial coverage of available information and to reduce uncertainty regarding hydrogeologic unit extents. The results provided a refined understanding of how the saturated thickness of the Ogallala and Edwards-Trinity aquifers vary throughout the study area, as summarized in a USGS article and in a new online USGS data viewer for the Southern High Plains study area. In the top photo, a scientist is collecting time-domain electromagnetic soundings. In the bottom photo, scientists are setting up the nuclear magnetic resonance (NMR) geophysical logging cable to collect information from a groundwater well. Credit: USGS/Andy Teeple. Photo is in the public domain. Click on photo for larger version. Credit: USGS/Kurt Kraske. Photo is in the public domain. Click on photo for larger version. Past monthly summaries are available online.